Sony STR-DA3500ES review | What Hi-Fi? The STR-DA3500ES is one of two new models in Sony's high-end Elevated Sound (ES) range. The world of home cinema has moved quickly since the emergence of HD and, as you'd expect, the '3500 is well up to speed. With Sony's latest HD Digital Cinema Sound onboard, it offers 7.1-channels of 100W per channel sound, should you shoehorn in the speakers. Four HDMI inputs and one output guarantee video switching opportunities, while there's 1080p upscaling and video upconversion, along with 7.1-multichannel analogue inputs. 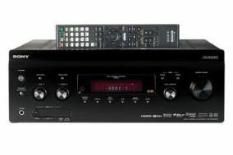 For internet radio you'll need to buy the far-pricier STR-DA5500 (£1300), the '3500 settling for FM and AM. We do like the Digital Media Port, though: it ensures connectivity for any portable devices, and multiroom capabilities for two other zones. The '3500 doesn't match an Onkyo or Denon in the style and build stakes, but it's as simple to set up and use. The DCAC auto-calibration system is fast and efficient, while the Xross Media Bar is intuitive and clear. Sonically we're impressed, too. As we assault ourselves with the Terminator Salvation Blu-ray, treble sounds are crisp and crunchy, while the midrange is blessed with plenty of detail. It's only at the bottom end of the frequency range that we're not wholly happy – it could use a little more weight and control. There are Award-winning Denon units either side of this price point (see Also Consider panel), and we can't help thinking the Sony finds itself caught short. It lacks the all-round performance-per-pound of the cheaper Denon, while falling short of the dynamics and subtlety of the pricier machine. The STR-DA3500ES turns in a strong performance, but with some superb performers looming large, it's not quite good enough.